The Flysurfer SONIC 2 embodies our vision of a modern, highly advanced foil kite. Each detail is designed with performance in mind. Beautifully balanced and responsive turning, optimized lightweight construction and refined aerodynamics all come together to create a sublime riding experience. The high-performance wing perfectly embodies the FLYSURFER DNA; its strengths are extreme jumps with long hangtime, precise force for hydrofoiling, and an excellent response for use in lightwind conditions. Irresistible and packed with innovative technologies, the SONIC2 has a presence you just can't ignore. The kite for pure enjoyment. Brilliant and well-thought-out, it is the perfect balance between dynamics and high efficiency. Experience a beautifully-balanced SONIC2 with overwhelming performance. Enjoy full control in any situation with FLYSURFER's most sturdy foil kite. We stand for aesthetic high-performance technology. Double Cordwise Ballooning - Double Cordwise Ballooning minimises the creasing of the cells on the kite to an absolute minimum. With exactly calculated arc-shaped panel cuts and double-stitched and glued seams, a perfectly smooth, high performance airfoil is created. 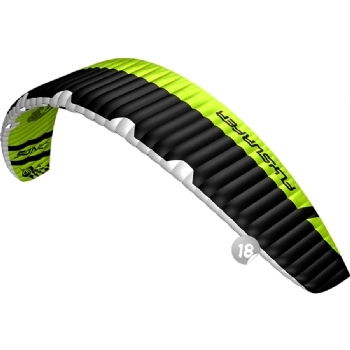 This optimizes the aerodynamics, especially the glide ratio and the low end of the kite. Flat Winglet Technology - The Flat Winglet technology reduces the induced aerodynamic drag, whilst at the same time increasing lift. This leads to a noticeable improvement in lift to glide ratio and forward flying speed of the kite. As well as constant pull while turning without wingtip collapse. Maximum Pressure Valves - The M.P.V in the center of the leading edge provides maximum air flow into the kite. The kite fills faster and accelerates even when fully depowered. A moving separator inside the valve transfers the airflow directly into the kite, regardless of angle of attack. Improved internal pressure means the kite is stiffer, more responsive and stable. Lightweight Construction - The SONIC2 benefits from a unique material composition. The LOTUS top sail forms a wrinkle-free airfoil and facilitates the relaunch in light winds. The DLX + bottom sail contributes to the directness of the kite and allows a reactive bar feedback. The ribs, V-belts and cells of the inner construction are designed for diagonal rigidity at highest loads to keep the SONIC2 in form. The weight reduction obtained increases stability and allows deeper downwind courses. Triple Depower Technology - There are 3 ways the kite achieves its maximum depower: Reducing the angle of attack, profile change and reducing the projected area. This leads to a huge wind range and ideal handling. Sharp Mini Ribs - Doubling the number of cells at the trailing edge increases its shape stability substantially. This means less turbulence, improved aerodynamics and thus performance. Automatic Drainage System - The proven drainage system integrated in the whole trailing edge of the kite, with finally openings near the tips, about the size of a hand. They allow water and sand to be drained automatically, without influencing the performance of the kite. 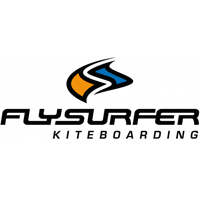 Quality of Workmanship and Durability - With this product we remain true to the FLYSURFER philosophy to make our products durable. Each cloth, each line and each component has been tested extensively, we always go for quality and functionality over price. Rigid Foil Technology - These stiffeners integrated in the leading edge ensure a smooth, creaseless and stiff topsail. This results in reduced aerodynamic drag and enhanced kite stability. As a result, the kite translates every gust of wind into propulsion without deforming the canopy. Overall, the Rigid Foils increases the kite's stiffness and makes it more dynamic. 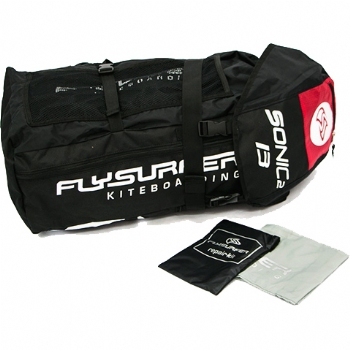 IKA registered - FLYSURFER is passionate about kite-racing and has registered the SONIC2 kite officially. This allows you to attend every official IKA racing event. Even if a FLYSURFER kite construction is officially approved for kite racing in the IKA class - Formula Kite, this does NOT mean that the kite itself is automatically IKA registered. This must be registered by the rider him/herself, so that he/she is allowed to officially compete in the IKA class - Formula Kite and it's specific events.